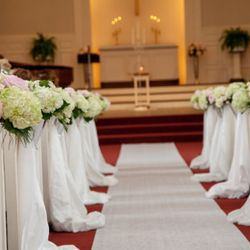 Once upon a time, a wedding ceremony wasn't a time for creativity since they usually took place in a house of worship, with 'Here Comes the Bride' as processional music and a long straight aisle that ended at an altar. 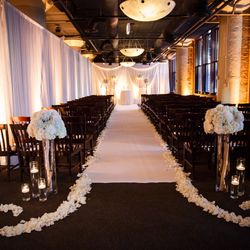 Today, couples may (and usually do) take many more liberties with their ceremony and incorporate creative backdrops into their wedding décor. 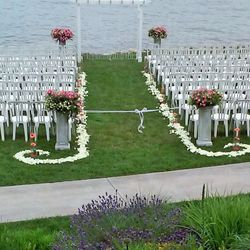 Frame the ceremony area with a magnificently decorated arbor, a pair of pedestals, swags of greenery or flowers, a backdrop, an altar, a chuppah or an arch - there is no limit!